There are now 200+ days until the start of the 6th IUCN World Parks Congress in Sydney, NSW. The dates of the event are November 12-20 2014. For those keeping track, here's the countdown! 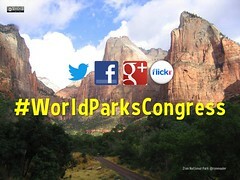 The congress takes place once every ten years and is the world's most influential gathering of people involved in protected area management. This week Cuernavaca, Morelos hosts the the 2014 WCPA Steering Committee meeting and we hope to provide live tweeting and some livestreaming coverage of this meeting. Updates will be shared on the Planeta Wiki. Disclosure: I will be participating at the event as the representative of Tourism and Protected Areas Specialist Group. By inviting collaboration from outside the conservation sector, including business, youth and the next generation of conservation leaders, this Congress seeks to move the protected areas agenda forward while also positioning protected areas within broader social and economic goals.